St John's church houses an exceptional and rare English lectern which dates to about 1450 - just a few decades after the church itself was built. It is one of only four of its type in the entire country and is the sole example still in a parish church (the others are at Eton College, Berkshire, Merton College, Oxford and King's College, Cambridge). 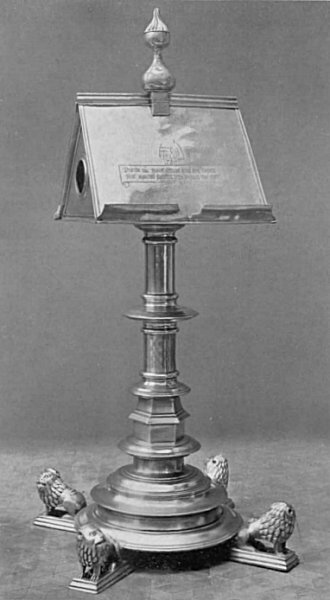 A lectern (from the Latin lectus, past participle of legere, "to read") is a reading desk with a slanted top, placed on a stand, on which books or documents are placed as support for reading aloud, as in a scripture reading, lecture, or sermon. 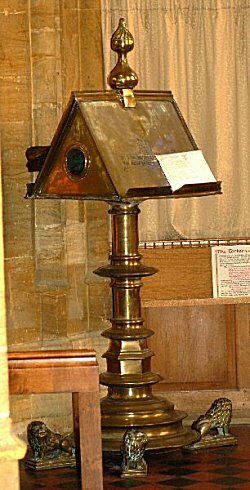 A double-desk lectern, it is referred to in old records, such as the Churchwardens' Accounts, as the 'Dext'. 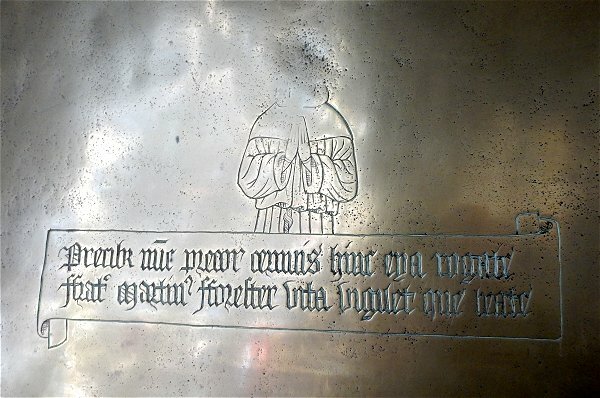 It is inscribed in Latin (see below) and complete with a picture of the donor monk, Brother Martin Forester. It was, possibly, originally from the Convent of Syon (properly called the Abbey and Convent of St Saviour and St Bridget of Syon) at Isleworth, who had held the Rectory as well as Lordship of Yeovil from 1420, when granted by Henry V, until the Dissolution. The double desk is built up from sheets of latten (copper alloys such as brass or bronze that appeared in the Middle Ages) and is surmounted by a large double-knob finial (an eighteenth century addition, probably replacing the figure of a saint). The two ends are each pierced with a large hole to accommodate scrolls. Both desk faces are engraved with the half-figure of a friar in a habit with full sleeves, a knotted girdle, and a cape with a hood. His hands are raised in prayer. Beneath is an inscribed scroll, illustrated and described below. The first essential for the making of a brass lectern was the carving of a wooden pattern exactly as it was intended that the finished article should appear. This would, of course, be done by an expert woodcarver and not by the founder. The wooden pattern would be made in as many pieces as it was convenient to cast it in. The pattern for the stem and base would have been made up of a succession of simple pieces of joinery, mostly turned on the lathe. The desk sits on a finely-proportioned pedestal of five concentric mouldings and the base rests on four projecting arms, on each of which is a lion sejant (sitting on its haunches). The four lions appear slightly disproportionate and although their heads and shoulders are large, their hindquarters seem quite inadequate when seen in profile. Frater Martinus Forester vita vigiletque beate. In 1856 Daniel Vickery wrote "The church possesses a very ancient Brass Lectern, the inscription on which has puzzled antiquarians to construe." It was still puzzling them in the 1890s and into the twentieth century. Sorry, but like the puzzled antiquarians, my schoolboy Latin is entirely inadequate to translate this but essentially it says "I pray you now offer humble prayers so that Brother Martin Forester may awaken in the blessed afterlife" or words to that effect. (Another translation is "Come make your petition from this place with humble prayers now I pray. And may Brother Martin Forester awake in the blessed life"). If anyone has a proper knowledge of Latin and can translate this accurately, please email me. Nothing further appears to be known of Brother Martin. The entry 'skowring' (scouring) implies that the lectern had been out of use for some time, perhaps in storage, necessitating its polishing in London. It was most likely part of the booty plundered by the State from the Church during the mid-16th century Reformation. Some of the Protestant reformers encouraged the removal of religious images by invoking the Decalogue's prohibition of idolatry and the manufacture of graven (sculpted) images. As a result, individuals attacked statues and images. However in most cases, as with the Yeovil lectern, the authorities removed images in an orderly manner in the newly reformed Protestant church. The head of Brother Martin Forester was defaced for this reason and the Churchwardens' Accounts for the year 1565 record the payment of twopence "P(ai)d for the puttynge owt of the two pictors uppon the brass dexte that the lessuns be reade on". At one time a chained bible was affixed to the lectern but this had been removed by the 1860s. Yeovil's lectern was exhibited at the Victoria and Albert Museum, London, in 1930 as part of an exhibition of English Medieval Art. At this time it was stated that the knob surmounting the desk was a seventeenth-century addition "probably replacing the figure of a saint". The lectern is probably the greatest accessible treasure, not just of St John's church but of Yeovil itself. However, it is today sadly and ignominiously tucked away in the north transept (the former Holy Cross chapel, now used as a storage area) rather than being cherished, used and displayed in pride of place in the church. Frankly, somebody should be deeply ashamed. The Latin inscription, in Blackletter, of the lectern with the defaced figure of Brother Martin Forester, the donor. Photographed in 2016. 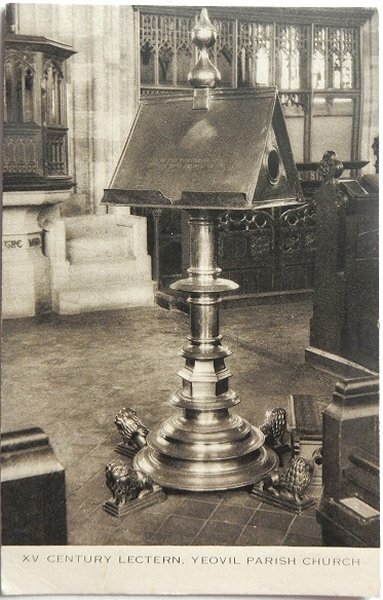 A studio photograph of St John's lectern dating to 1930 at the time of the exhibition of English Medieval Art at the Victoria and Albert Museum, London. 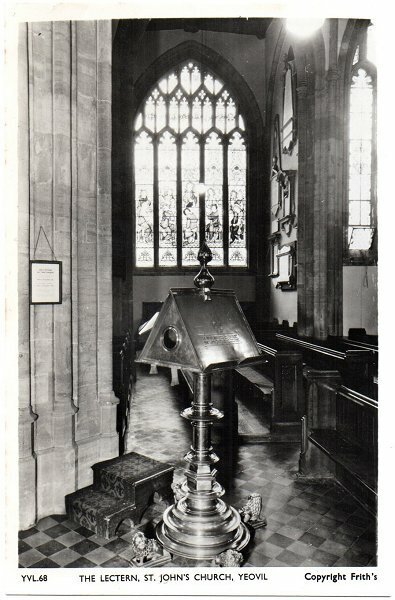 A good postcard of 1944 showing the lectern - one of a short series of postcards of the interior of St John's church. Sadly, it doesn't shine like this any more. A less-impressive postcard of the 1960s showing the lectern in its setting.